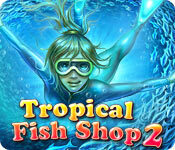 Tropical Fish Shop 2 is rated 4.2 out of 5 by 16. Rated 5 out of 5 by mrm2006 from A New Store to Design Yourself. Anabel found a treasure in an old sunken pirate ship and with the money built a swanky new hi-tech store. Help her design it by earning money with the fish you catch. After catching fish, etc. in the match 3 game - which includes amazing bonuses for 4+ matches, you have to get an item from the top of the tank to the bottom. 3x. You will need these items in the HOG. Every 3 levels, you have to find items in an HOG. The items mentioned above will be very useful in your completion of these games. The items can be somewhat difficult to find - just follow the clues. Also interspersed with the match 3 game and HOGs are various mini games that range from easy to a little thought-provoking. PLUS, you get to design your/Annabel's store after you've earned enough money for each item. You get to choose from 3 designs of each item. This game is such a step up from the previous version. I had so much fun, I flipped when the free demo was over - LOL. THAT is my personal "wow" factor indicating, for me, that this game is a definite purchase. I encourage everyone who enjoys match 3 games, HOGs or mini games to give this one a try. Happy Gaming! Rated 5 out of 5 by iansmomm from LOVE IT So much variety! 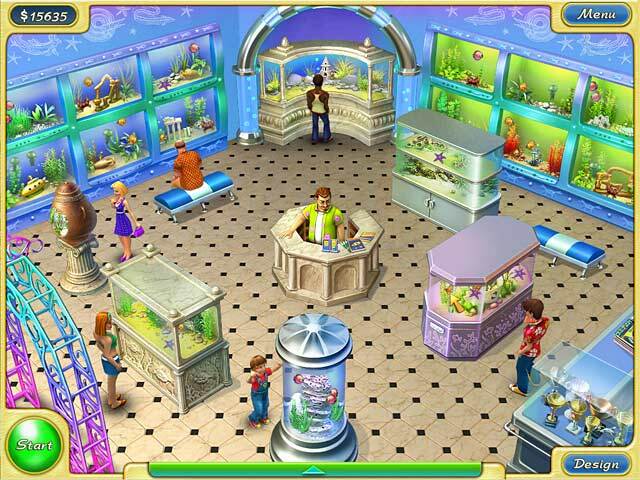 While the main theme is to furnish a new fish store with great options of tanks and other furnishings, you do so by playing challenging match 3 games, finding objects, challenges against neighboring pet stores, and skill games. The graphics are good, the match 3 decently challenging, and like the variety of tanks and such to choose from at different prices. I was addicted by the time the hour ran out! Definitely one I'm going to buy today! Rated 5 out of 5 by Gameritis50 from an excellent addition to your match 3 games Kinda old school as far as graphics and music go, But overall a great game. 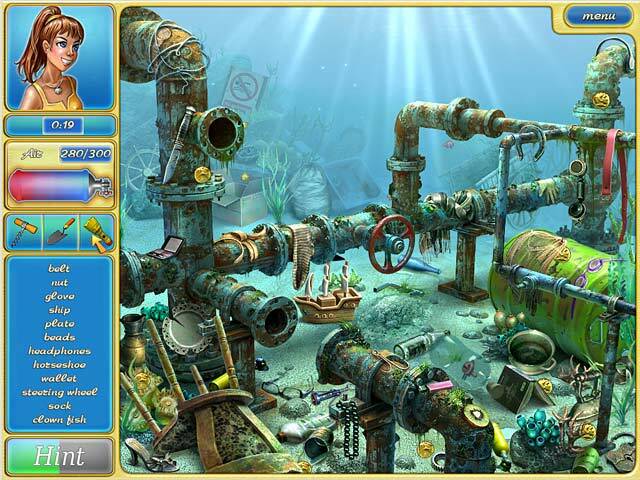 Upgrade your fish store, match 3, hidden object, diving competitions. Its enough to keep you busy. Rated 5 out of 5 by BrendaB13 from I love this Match 3 game! I really enjoyed playing this game. The best thing for me was the puzzles they were not always that easy which is awesome! Rated 5 out of 5 by myyorkies1994 from A Great M3 That Has Everything! This is one of my favorite games because it has a bit of everything: swap M3 with quotas that require some strategy, hidden object, other mini games, and buying items to build your store. It never gets monotonous and the air tiles help replenish your timer, so time is plentiful. The colors are bright and vivid, and the tile characters are cute! I'd replay this one anytime! Rated 5 out of 5 by Michelle260 from Felix would like this one! An easy,( as all March three games are), relaxing game where you gain points and decorate a tropical fish shop. I like games where I can win money by matching and then purchase items and redecorate. The choices for rebuilding are alittle lame but the Match 3 squares are really big, I like that. Rated 5 out of 5 by sereneorchid from Animated matching; design your own aquarium shop This is a marvelous game with beautiful graphics. Let's face it: there are lots of Match 3 games, and many just kind of sit there on the screen and don't do much of anything. What's fun about this one are the 3-D sea life animations on the game board that wiggle around and blink their eyes at you. Even better, the critters are nicely sized and easy to see, unlike some games where the matching tiles are the size of a baby's fingernail and require a magnifying glass to see. Sound effects are also fun. If you play the timed mode, the air leaks out of a diver's oxygen tank, and you match bubble tiles to refill it. The bubbling sound is very realistic and amusing. But the air ran out a little fast for me, so I reverted to the easy play option. During the matching games, handy objects drop off the game board that will be used in future hidden object puzzles. The HO puzzles are well done (and animated, too), with objects drawn large enough and accurately enough so that you can actually recognize them. There are also mini-games which can be skipped immediately if you just don't feel like being challenged. My favorite part of the game is using the money earned playing games to design my own aquarium store. You can mix and match from several design styles, and change your mind at any time. To make it more realistic, the aquarium tanks are animated, as are the customers and the store manager. This game works for all ages and skill levels; I'd encourage older relatives to play it as a fun way to keep the brain cells working. Rated 5 out of 5 by Rebr2009 from Excellent Daily Deal ! It's not just a match3 ! It has several games, including HOS (where you have to use objects that you collected in match 3,), puzzles, competitions (you play against another person), etc. 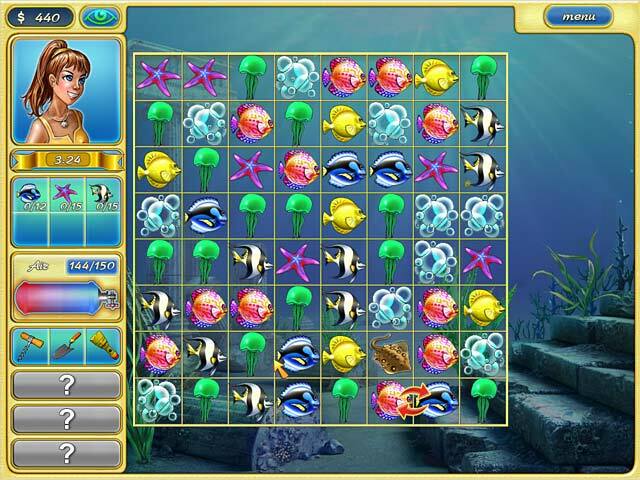 In all games, you earn money to build a fish store, buy aquariums, fishes, extras, etc. A colorful, cute, entertaining and relaxing game. Cool game at a great value ! Rated 4 out of 5 by SpookyPigdog from relaxing I agree with other comments; this game is not as enjoyable as Fishdom in the decorating department, but I did find it relaxing and enjoyable. The only gripe I have is that there did seem to be rating system on each level, but there was no opportunity to replay levels - no map to see how you did or to better your score. Otherwise, a relaxing game at normal level.I loved the comps with the 'other' players. Rated 4 out of 5 by carolar from OK as a daily deal As a Daily Deal, I have no complaints as I feel I got more than my money's worth. The graphics were great as well as the audio. It added an additional challenge while playing against another "customer". The opportunity to choose the shop's decor was fun to play with but, except for the "customer" challenge, it did become a little boring after awhile.